Manila shaken by mild earthquake. 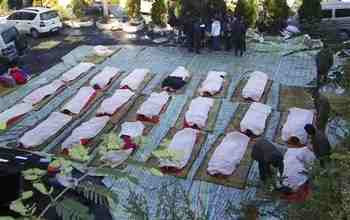 30 November 2011. Slightly before 8.30 am on Wednesday 30 November 2011 an Earthquake with a magnitude of 6 on the Richer Scale occurred at a depth of about 2 km on the Manila Trench 200 km to the northwest of the city of Manila. While this was a fairly severe quake, and shallow enough to be extremely dangerous, it was far enough off shore to cause serious damage, though it was felt across much of the west of Luzon island, including in the Philippine capital, Manila. No tsunami warning has been issued. The location of the 30 November quake. The Manila Trench runs along the western edge of Luzon and the northern Philippines, at the boundary of the Eurasian Plate and the Philippine Mobile Zone, an area of small fragmented tectonic plates underlying the Philippines. To the east these are in turn being subducted beneath the Philippine Sea Plate, and to the south beneath the Sunda Plate. All of these small plates form part of a boundary between the Eurasian Plate and the Pacific Plate, which creates a complex tectonic setting running from Japan to Papua New Guinea. Along the Manila Trench the Eurasian Plate is being forced beneath the Philippine Mobile Belt creating friction. As the subducting plate sinks it catches on the overlying plate, so that it moves in stops and starts, causing earthquakes. As the plate is forced further down it partially melts, and the melted material rises up through the overlying Mobile Belt, erupting at the surface to form volcanoes; these volcanoes are ultimately responsible for all the land that makes up the Philippines. It is sometimes reported that the Philippine Volcanic Arc is caused be the subduction of the Pacific beneath the Philippine Plate. This is incorrect; the Pacific is being subducted beneath the Philippine Sea Plate, which lies to the east of the Philippine Islands. Where this subduction occurs it does create a volcanic island arc; the Marianas, far to the east of the Philippines. All this makes the Philippines a very tectonically active place. 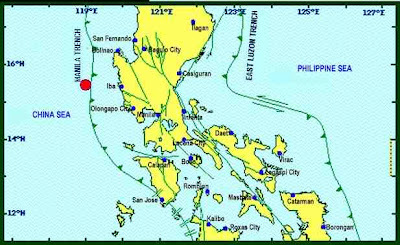 The Philippine Institute of Volcanology and Seismology recorded eighteen on 20 November 2011, though most were quite small. The Philippines have suffered seven earthquakes measuring greater than 6 on the Richer Scale since 2000. Only one of these, in 2002, caused recorded fatalities. The islands also boast 37 volcanoes, of which 18 are active. 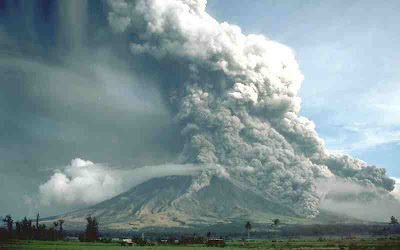 Mount Mayon in the Philippines erupting, with a dramatic pyroclastic flow to the left. See also Hokkaido Earthquake, Earthquake in Vanuatu, Fukashima shaken by large earthquake, Fresh eruption on Mount Karangetang and Earthquakes on Sciency Thoughts YouTube. Is the Jebel Hadid Structure in southeast Libya an impact crater? The Jebel Hadid Structure is located in southeast Libya, roughly 370 km SSE of Al Kufra. It is made up of five concentric rings, the outermost of which is approximately 4.7 km across. Jebel Hadid means 'Iron Mountain' in Arabic. The area was heavily land-mined during the Chadian-Libyan War of 1978-1987, making it a difficult if not impossible place in which to carry out geological fieldwork. However the structure is clearly visible in satellite images, and a number of studies of the area were made before 1978, the data from which is still available. A satellite image of the Jebel Hadid Structure. In 2009 a paper appeared in the journal Marine and Petroleum Geology in which Martim Schmieder and Elmar Buchner of the Institut für Planetologie at Universität Stuttgart and Daniel Paul Le Heron of Royal Holloway, University of London, propose that the Jebel Hadid Structure is an impact structure, caused by an extra-terrestrial object striking the Earth. 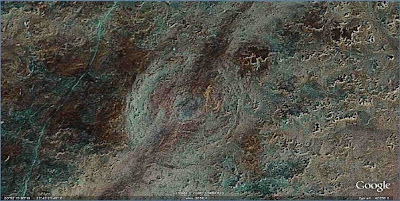 There are a number of terrestrial occurrences that can cause circular marks on the surface of the Earth. The most obvious if these is volcanism, but the Jebel Hadid Structure is situated entirely in sedimentary rocks, so this can be ruled out. Salt or gypsum diapirism can both form circular structures; these are caused by mineral rich waters drying up, causing the minerals to precipitate out of solution. Since these minerals occupy slightly more space as solids than as solutions they can form 'diapirs' circular areas of uplift (bulges). However there are no indications of evaporite deposits at Jebel Hadid. Sand volcanism, caused by gas bubbles erupting through wet sands, can be ruled out by the large size of the structure; 4.7 km gas bubbles are to improbable for consideration. 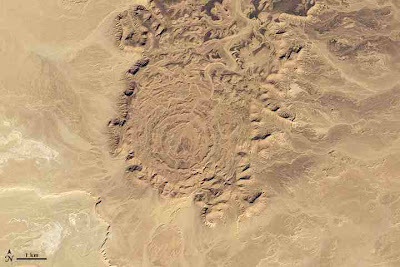 Karst structures are formed by the dissolution (chemical weathering) of limestones and can be circular in shape, but there do not appear to be any significant limestone deposits around Jebel Hadid. Finally circular structures can be formed by the thawing and decompression of deposits which have been covered by glaciers, as sediments expand and are forced upwards in circular bulges called pingos. However the deposits of Jebel Hadid are located in the Libyan Dessert, where glaciation is unlikely, and Africa has been drifting northwards since the breakup of the Gondwana Supercontinent, so that it has had to cross the equator since its last encounter with glacial conditions, which would have been at the very latest in the Devonian. The structure is partially overlain by Miocene (23-5.3 million year old) fluvial sandstones (sandstones formed in a river basin), and is found in Early Cretaceous sandstones, the older rocks beneath, though it is not completely clear how deep the structure extends. There were apparently no rocks laid down in the area between the Early Cretaceous and the Miocene (not unusual) so if the structure is an impact crater then it would have been caused by an object falling to Earth during this period. There would not necessarily be any remains of the object at the impact site, as an object burning up in the low atmosphere would still cause a considerable pressure wave to strike the surface. Concentric rings within impact structures are caused by uplift of the central area after the initial strike as the rocks decompress, and by collapse of the outer rim. The structure of Jebel Hadid, as envisioned by Schnieder et al. Jebel Hadid resembles a number of impact structures that scientists have been able to access, such as Tin Bidar in Algeria and Aorounga in Chad (impact structures are more common in desert areas because they last longer; in other areas they tend to be buried or eroded quickly), supporting the hypothesis that Jebel Hadid is an impact structure. The Tin Bider Impact Structure in Algeria, which Jebel Hadid resembles. See also A close encounter with Asteroid 2005 YU₅₅, When Moons Collide and Visiting Vesta. A new study of the HAT-P-13 planetary system. The HAT-P-13 planetary system was discovered in 2009, by the Hungarian-made Automated Telescope Network, a network of six small telescopes located at Konkoly Observatory near Budapest, Steward Observatory in Arizona, the Wise Observatory in the Negev Desert, Israel, Las Campanas Observatory in Chile, Siding Spring Observatory in Australia and the International Amateur Observatory near Gamsberg in Namibia. The HATNet project aims to detect and study extrasolar planets transiting their host stars. The star-system is in the constellation Ursa Major, roughly 697 light years from the Earth. It is also sometimes referred to as GSC 03416-00543, which is General Star Catalogue followed by a set of co-ordinates. The star in the system HAT-P-13A ('A' for the first object discovered in the system, capitalized because it is a star) is a G-type main sequence star, the same type of star as our sun, though it is slightly larger, older and cooler. It is 1.2 times as massive as the sun, has a radius 1.5 times as great, and has a much higher metal content, a sign it is reaching the end of its life on the main sequence of stars. This star is circled by at least two major planets, with the possibility of a third. HAT-P-13b ('b' for the second body in the system, not capitalized because it is not a star) is a transiting Hot-Jupiter type planet. It orbits the star every 70 hours at 4% of the distance between the Earth and the sun, and has a mass 85% of that of Jupiter. Despite its lower mass it has a considerably larger volume due to its high temperature, giving it a radius of 1.3 times that of Jupiter. HAT-P-13c is a much has not been directly observed, but its presence is known with a considerable degree of confidence, due to its strong gravitational effect on HAT-P-13b. It has a mass of at least 15 times that of Jupiter, making it a borderline contender for Brown Dwarf status; an object large enough to undergo convection in the interior like a star, rather than chemical stratification like a planet, but not massive enough to fuse hydrogen like a star. Brown Dwarfs may fuse deuterium and possibly lithium, and generate a considerable amount of heat due to gravitational effects. HAT-P-13c orbits at approximately 1.86 times the distance at which Earth orbits the sun (slightly further out than Mars) every 428 days. It has not been seen to transit (pass in front of) HAT-P-16A, but may do so. The orbit of HAT-P-13b and HAT-P-13c. It is not clear if HAT-P-13c passes in front of the star when seen from Earth. Despite the confidence with which astronomers view the existence of HAT-P-13c, attempts at building a model of the system have consistently failed to predict accurately the transits of HAT-P-13b. This has led to speculation that the system may contain a fourth body, HAT-P-13d, though this has not been detected, nor have scientists been able to develop a reliable model of the system using a four-body scenario. On 24 November 2011 a paper was posted on the online arXiv database at Cornell University Library, by a team lead by John Southworth of the Astrophysics Group at Keele University, describing a new study on the HAT-P-13 system and the conclusions drawn from it. This paper is due to be published in print form in the Monthly Notices of the Royal Astronomical Society. Southworth et al. reviewed a number of studies made of the HAT-P-13 system using Cassini Telescope at Loiano Observatory in Italy, a Schmidt-Cassegrain telescope at Portalegre in Portugal, a 1.2 m telescope at the Fred L Whipple Observatory in Arizona, two telescopes at Konkoly Observatory, and the Faulkes Telescope in Hawaii, and attempted to build a model of the system based upon this. Like previous studies, Southworth et al. were unable to satisfactorily resolve the known data about the HAT-P-13 system and come up with a working model that could predict the transits of HAT-P-13b, either with or without HAT-P-13d. They were, however, able to build a model of the system without a forth body if they assumed that both HAT-P-13A and HAT-P-13b were considerably more massive than previously assumed, leading the team to conclude that this was in error in earlier studies, rather than a missing body from the system. See also The Kepler-18 planetary system, Just how big is Iota Draconis b? and Exoplanets on Sciency Thoughts YouTube. Fishermen targeting tuna in East Timor at least 42 000 years ago. 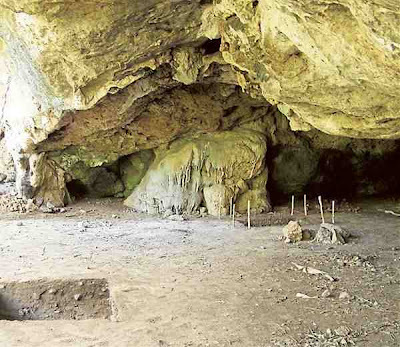 The Jerimalai Rock Shelter was first uncovered in 2005, on a limestone terrace (flat area of limestone) at the eastern tip of East Timor. It was occupied by anatomically modern humans from about 42 000 years ago until about 2500 years ago. The site has previously been noted for its striking obsidian artifacts; archaeologists are uncertain of the source of this obsidian, which has not been found on Timor, implying it may have been traded from further away. Other sites in the area have yielded similar tools, as well as spectacular stone carvings, shards of pottery and signs of animal domestication. The 25 November 2011 edition of the journal Science contains a paper by a team lead by Sue O'Connor of the Department of Archaeology and Natural History at the Australian National University which describes the discovery of the remains of large pelagic (ocean going) fish including tuna, as well as the oldest known fish-hooks to have been discovered anywhere in the world. These hooks were made from shell. It is not clear if the hooks were used to catch the tuna, or whether they were caught in another way (such as netting them at they passed through a narrow channel), but either way catching such fish shows a remarkable level of skill and technological achievement for such an early period; these remains are roughly ten times as old as the Egyptian pyramids or Stonehenge, from a time when Europe was still locked in an Ice Age. The July 2011 edition of the journal Archaeology in Oceania contained a paper by a team lead by Christian Reepmeyer, also of the Australian National University, detailing the extent of obsidian tool use in at Jerimalai and other sites in East Timor and Indonesia. 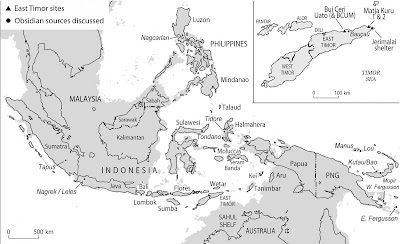 This suggested that all the obsidian found at different locations in East Timor was from a single source, but was unable to locate the source of this material, nor establish if it came from East Timor or further afield. Obsidian is a glassy rock formed by the rapid cooling of rhyolitic lavas at the surface. As such it is seldom found in large deposits, so it is possible that the source was exhausted. Sites in East Timor and the surrounding islands where sophisticated obsidian tools have been found. 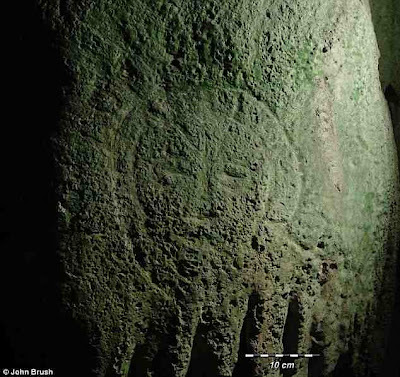 In 2010 a paper by Sue O'connor in the journal Antiquity detailed the discovery of sophisticated rock art at Lene Hara on the north coast of East Timor, which bore a strong resemblance to rock art in Australia. Rock carving at Lene Hara. We have known for a long time that early humans in this part of the world had good seagoing skills, since they reached Australia approximately 50 000 years ago, but until fairly recently these people were still widely looked upon as 'primitive'. The picture now emerging from Jerimalai, and other sites on East Timor, and across Indonesia and the islands of Oceania is of a remarkably sophisticated civilization, trading widely and achieving technological feats that would not be matched in other parts of the globe for many millennia. What is particularly remarkable about the East Timor sites is their proximity to the Island of Flores, where an entirely separate species of human, the diminutive, Homo floresiensis, is thought to have survived till as recently as 19 000 years ago. This would make the fishermen and mariners of ancient Timor and other islands the most advanced culture known to have lived in close proximity to another species of human, though they were clearly active explorers with an impressive array of complex hunting tools. See also Out of Africa(?) and Mammals on Sciency Thoughts YouTube. The end of the Permian. The Earth has been dominated by multi-cellular life forms (animals, plants etc.) for a little over half a billion years, but life has not had it easy throughout all of this time, it has been hit by a number of mass extinction events, during each of which a large proportion of the life-forms existent went suddenly extinct. The best known of these is the extinction event at the end of the Cretaceous, which included the extinction of the non-avian dinosaurs and other large Mesozoic animals, but the biggest extinction event occurred at the end of the Permian, when roughly 96% of all marine and 70% of all terrestrial life was wiped out. The Permian Extinction is sometimes known as the Great Extinction or the Great Dying. During the Permian Extinction marine invertebrate groups such as the trilobites, eurypterids (water scorpions) and corals (modern corals are not closely related to Palaeozoic corals) became extinct, as did fish groups such as the acanthodians. Terrestrial life was also badly hit, as well as wiping out many species of vertebrates the Permian Extinction also badly effected insects and plants, groups not effected to any significant extent by any other extinction event. 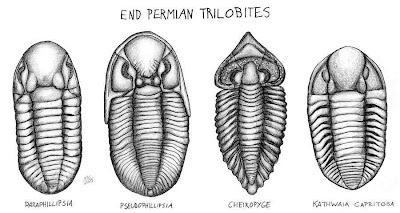 Trilobites dominated Earth's seas for 250 million years, but were wiped out at the end of the Permian. Exactly how long the extinction event lasted has been a source of debate, with estimates ranging from over 5 million years to under 10 thousand. How long the extinction lasted is important when trying to determine the cause of the extinction. The most probable cause is generally considered to be environmental degradation due to gasses released by the Siberian Traps flood basalts, the largest known volcanic episode in the Earth's history, which covered an area the size of modern Europe in molten lava. This would have released vast amounts of CO₂ into the atmosphere, with a catastrophic outcome for the Earth's climate. Geochemists have been able to determine that the concentration of CO₂ in the atmosphere at the end of the Permian rose by about 2000 parts per million (ppm), which certainly fits in well with this theory (modern CO₂ levels have risen by slightly over 100 ppm since the industrial revolution, causing great alarm among climatologists). This works well as a model if the extinction and the volcanic outburst were both rapid, but if either took place over a longer period then it does not tie up so well; a longer period of eruptions would not cause the CO₂ levels to rise so sharply, and a longer period of extinction could not be explained by an abrupt event. 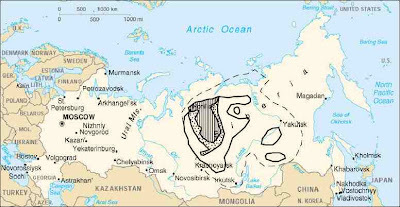 Map showing the extent of the Siberian Traps flood basalts (striped area), pyroclastic material (dotted area), intrusive magmas (i.e. 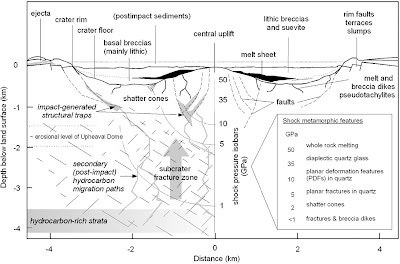 magma that spreads within strata bellow the surface, areas inside the solid lines) and total extent of the Siberian Platform (within dashed lines). The 17 November edition of the journal Science contains a paper by a team lead by Shen Shuzong of the Nanjing Institute of Geology and Palaeontology in which they describe the results of detailed studies of nine sites in southern China at which there are well preserved sequences of rocks spanning the end of the Permian and the beginning of the Triassic. Such sequences are extremely rare, which is why the subject has remained the centre of controversy for so long, so that the sites examined in this study are a significant proportion of the total available data on the subject (only two of these sites have been studied previously). In addition to the fossil data recovered from the sites the scientists were able to study layers of volcanic ash within the rocks, from which they were able to obtain dates based upon the rate at which uranium decays into lead. Lead does not form the same minerals as uranium when it cools from molten magma, so any lead present in uranium minerals must be there due to the decay of uranium since the minerals formed. Uranium decays at a known rate, so the amount of lead in the minerals can be used to precisely date the ash layers. This enabled the scientists to obtain dates for the fossil beds calibrated to under 100 000 years, remarkable on deposits a little over 250 million years old. Using this data the team concluded that the end Permian extinction took place over less than 200 000 years, and probably less than 100 000 years; the peak of the extinction event was 252 280 000 years ago. This puts the extinction within a few tens of thousands of years of the eruption of the Siberian Traps flood basalts, supporting the theory that these were the primary cause of the extinction event. See also The End of the Cretaceous, The dangers of a modern Laki-style eruption in Iceland, Eruptions on Mount Nyamuragira in the Virunga National Park and Volcanoes on Sciency Thoughts YouTube. 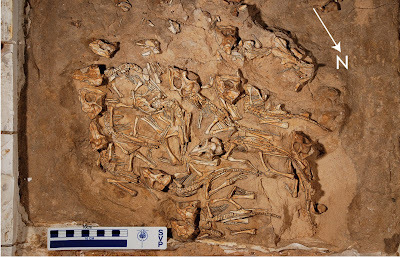 Nesting behavior and parental care in an Ornithischian Dinosaur? Protoceratops was a primitive ceratopsian dinosaur (the ceratopsian dinosaurs were quadruped dinosaurs with distinctive horns and frills at the back of their skulls), discovered in Mongolia in the 1920s by American palaeontologist Roy Chapman Andrews. They are well known to scientists as a large number of specimens have been discovered, often well preserved and in groups. This was due to the environment in which they lived, a desert with rolling sand dunes, where they had a good chance of being rapidly buried (not always after they died) and then preserved as fossils. Protoceratops lived between about 75 and 71 million years ago in the interior of north-east Asia. Unlike more advanced members of the ceratopsid group, Protoceratops lacked large horns and a well developed neck frill. It was also much smaller than later ceratopsians, about the size of a sheep; by comparison the better known Triceratops could reach 9 m in length and stood 3 m at the shoulder, more than twice the size of a White Rhinoceros. There are currently two recognized species of Protoceratops, the original Mongolian species, P. andrewsi, named after its discoverer, and a slightly larger species from Inner Mongolia (to the south), P. hellenikorhinus, which had a slightly larger frill, better developed (though still small) horns and premaxillary teeth (which P. andrewsi lacks). Some scientists consider Protoceratops to be a single, sexually dimorphic species, with the apparent difference in distribution being due to sampling error (i.e., not enough samples have been discovered to show that the two types coexisted in the same space). The November edition of the Journal of Paleontology (the journal of The Paleontological Society) contains a paper by a team lead by David Fastovsky of the Department of Geosciences at the University of Rhode Island, which describes the discovery of a nest of juvenile Protoceratops, apparently buried alice during a sandstorm. The nest contains 15 well preserved infants, too well developed to be hatchlings, but probably less than a year old, all apparently facing in the same direction, towards the prevailing wind. The Protoceratops nest. The arrow gives the direction of the prevailing wind, and the scale bar is in centimeters. Sedimentologists (geologists that study sedimentary rocks) are able to determine wind direction in ancient eolian (wind blown) sediments from the shape of the dunes. Dunes form as grains of sand are blown up the windward slope, leading to a gentle slope in the direction the wind is coming from. However this cannot climb infinitely, so on the leeward (away from the wind) side there is a sharper slope, where the grains reach the top of the dune, then collapse down the other side in a series of small avalanches (occasionally trapping small dinosaurs). 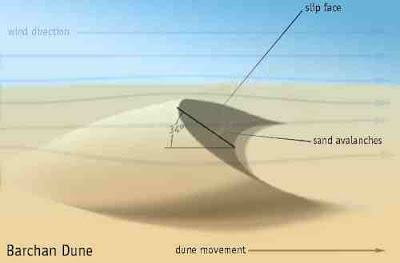 A sand-dune migrating with the wind has a distinct shape. The three dimensional shape is hard to spot in sedimentary rocks, but the distinctive cross section is easily recognized. Identifying infant dinosaurs is not always easy. The distinctive features of animals like Protoceratops are not often present in infant animals. As such it would be difficult to distinguish a juvenile Protoceratops from the juvenile of another primitive ceratopsian, such as Psittacosaurus, Liaoceratops or Auroroceratops. However none of these species have the same physical or temporal distribution (i.e., they were not found in the same time and place), so Fastovsky et al. have tentatively assigned the specimens to the species Protoceratops andrewsi. Ruling out P. hellenikorhinus was even more difficult, as this species lived at the same time and (relatively) close by. The differences in size would not show in a juvenile of unknown age and development, and the horns and frills are less developed than in an adult of either species. This leaves the possibility of cutting into a skull to try to detect developing premaxillary teeth, which would be diagnostic of P. hellenikorhinus. It was deemed unwise to damage the fossils in this way, as the absence of teeth would not be evidence for the specimens being P. andrewsi, since it is unclear at what stage the teeth start to develop. It is possible that in future the specimens could be x-rayed, since the presence of teeth would determine that the infants were in fact P. hellenikorhinus, though this would be an expensive and difficult process for a relatively academic point. The delicate skulls of the juvenile dinosaurs. Scale bar in centimeters. Whatever the exact classification of these dinosaurs, it is clear that they were primitive ceratopsians, and that they had stayed in the nest after hatching, which has profound implications for our understanding of how these animals lived. This is because an immature dinosaur would be highly unlikely to remain in the nest unless it was receiving parental care, something that has long been a debating point among palaeontologists. Birds, the only living dinosaurs, typically show extensive care for their young, with most species incubating their eggs with their own body-heat, and many continuing to feed the young in the nest for some time after they hatch. Crocodilians, the closest living relatives of the dinosaurs, neither incubate their eggs nor feed their young, but (unlike most other reptiles) most species attend their young at the time of hatching. Nests containing the eggs of many species of Mesozoic dinosaur have been discovered in the past, including some with adults apparently incubating the eggs (also overrun by Mongolian sand dunes). 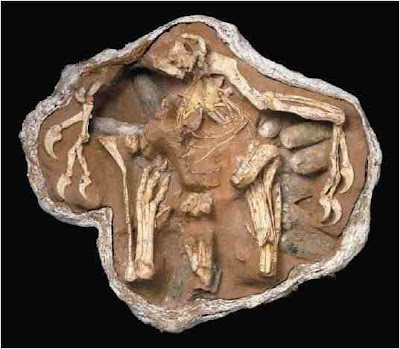 However these incubators have always been from Therapod species closely related to birds, leaving room for speculation about the degree of parental care among dinosaurs as a whole. For some species, notably the larger sauropods, it is difficult to see how the gigantic adults could have cared for the tiny infants, though the animals are known to have travelled in packs containing individuals of differing sizes and therefore ages. 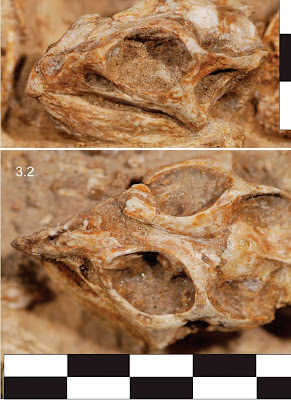 Citipati osmolskae, an Oviraptid Therapod closely related to the earliest birds, discovered apparently incubating eggs when it was overrun by a sand dune in Cretaceous Mongolia. Ceratopsians are advanced Ornithischian dinosaurs, about as distantly related to birds as it is possible to be and still be a dinosaur. There are two possible interpretations that can be made from the discovery of parental care in Ceratopsians. Either caring for young was a primitive trait in dinosaurs (i.e. a trait found in the earliest members of the group, and persisting in their descendants - though it would still be possible for some groups to loose the trait) or it evolved separately in advanced Therapods and primitive Ceratopsians, suggesting that the trait was possible and advantageous, and therefore likely to have evolved in other groups as well. In either event this discovery is likely to fuel further research into parental care among the palaontological community. See also Dinosaur footprints discovered in Southwest Arkansas, A new Troodontid Dinosaur with an injured toe, Dinosaur feathers preserved in amber and Dinosaurs on Sciency Thoughts YouTube. 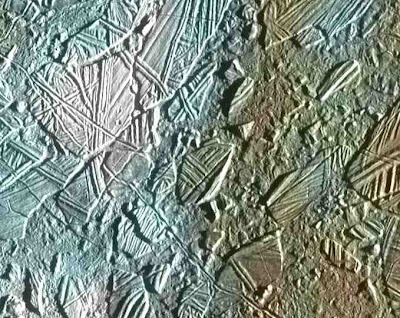 New study of Europa's 'chaos terrains' reveals subsurface lakes, but not oceans. Europa is the fourth largest moon of Jupiter, and the fifteenth largest body in the solar system. It was one of the four moons discovered by Galileo Galilei in 1610. The Jovian system was first visited by the Pioneer 10 spacecraft in 1973, then its sister craft Pioneer 11 a year later. The Voyager 1 and Voyager 2 spacecraft both passed through the Jovian system in 1979, gathering further information. The Galileo probe orbited Jupiter from 1995 to 2003, building up a detailed model of many of the Jovian Moons, including Europa. 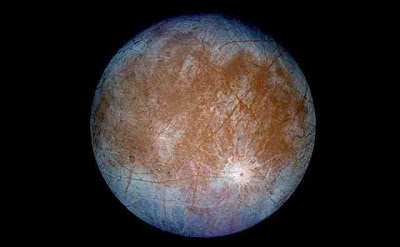 The picture that of Europa that emerged from these missions was of a frozen, icy, world, slightly smaller than our moon. However the surface of Europa is not smooth, the surface is dotted with circular areas of broken terrain known as lenticulae ('freckles' or 'spots'), thought to be caused by water breaking through to the surface. Some of these areas show particularly disruption, with sections of what appear to be shattered crust locked in smoother areas of ice, resembling icebergs caught in frozen sea-ice. These areas are referred to as chaoses, or chaotic terrains. The Conamara Chaos, one of Europa's larger chaotic terrains. Planetary scientists have taken these chaotic terrains as evidence of a liquid ocean beneath the surface of Europa, kept fluid by heat generated by tidal forces as Europa is periodically stretched then released by the gravity of the other moons. From time to time, it is thought, these tidal forces cause water to leak up to the surface, creating the lenticulae and chaoses. This subsurface ocean has often been considered the most likely site for extra-terrestrial life within the solar system by both scientists and science-fiction writers, on the basis that all life as we understand it needs life to survive. The 16 November 2011 edition of the journal Nature, contains a paper by a team lead by Britney Schmidt of the Jackson School of Geosciences at the University of Texas at Austin, in which the authors detail a detailed study of both the chaos terrains of Europa, alongside similar areas around subglacial volcanoes on Earth. From this they conclude that the chaos terrains could be generated by large lakes as shallow as 3 km bellow the surface of the moon. Like the proposed ocean they could be kept liquid by tidal forces, and occasionally be caused to breach the surface by the same. Being so close to the surface such lakes would be more temporary structures than the ocean, and would be far less likely to harbor life. The presence of the lakes would not preclude the presence of an ocean as well, but Schmidt et al. have demonstrated that it is not necessary to generate the observed surface of Europa. See also Saturn's moon Dione found to have an atmosphere, Pluto gains a fourth moon and Jupiter on Sciency Thoughts YouTube. Eruptions on Mount Nyamuragira in the Virunga National Park, November 2011. On the evening of 6 November 2011 a fissure opened on the northern flank of Mount Nyamuragira, from which a lava fountain emerged and lava spread out over a wide area. Nyamuragira is in the Virunga National Park in the east of the Democratic Republic of Congo, close to the Rwandan border, and the glow from the volcano was clearly visible that night from the city of Goma, across the border in Rwanda. Footage of the November 2011 eruption, taken from the Virunga National Park offices. Eruptions of this sort are not unusual on Mount Nyamuragira, which has a reputation for being Africa's most active volcano. Nyamuragira is a shield volcano, with a broad shallow dome structure made up layers of lava, unlike the more famous stratovolcanoes which have a cone shape, made up of layers of ash and lava. Eruptions from Nyamuragira are very frequent, the last being in January 2010, when a fissure opened on the southeast flank of the volcano. Eruptions from fissures on the flanks of Nyamuragira are at least as common as those from the (small) caldera at the summit. Small cones are often formed by these fissure eruptions, but they are seldom long lived. The lava produced by Mount Nyamuragira is a low silicone basalt. This tends to have a very low viscosity, i.e. it flows very freely, rapidly covering a wide area. Because of this few people choose to live near the mountain, so it is seldom a threat to human life, though it has in the past caused problems for vulnerable wildlife populations, such as the human-familiarized chimpanzees and gorillas of Virungu National Park. 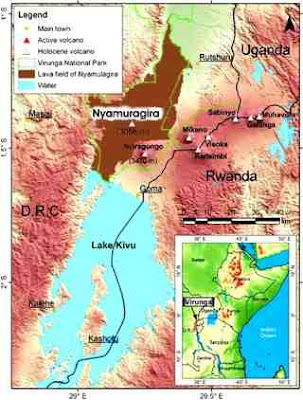 The location of Nyamuragira, and the extent of it's lava fields. Basalts are more usually associated with volcanoes on oceanic rifts that with continental volcanicity. The presence of basaltic volcanoes in the African interior is taken as evidence that the continent is slowly splitting apart along it's great rift valleys (not on any timescale likely to threaten human life). Nyamuragira lies on the Eastern Branch of the East African Rift; most volcanoes in this area produce more typical siliclastic lavas, but there are several other basaltic volcanoes in the area, such as the nearby Mount Nyiragongo (Africa's second most active volcano - between them the two volcanoes account for 40% of all volcanic activity on the continent), the less active Visoke, which last erupted in 1957, and the inactive Karasimbi, Mikeno and Muhavura volcanoes. The Western Branch of the Rift Valley also has basaltic volcanoes, most notably Ol Doinyo Lengi, to the south of Lake Natron in Tazania, the worlds only active carbonitic volcano (i.e a volcano that produces lavas containing carbonate compounds), and the nearby extinct, but dramatic, Mount Shombole. 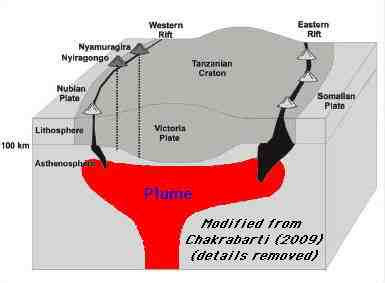 The plume underlying the East African Rift, which appears to be slowly pushing the continent apart. There are also basaltic volcanoes along the 'Cameroon Line' in West-Central Africa, including Mount Cameroon and the volcanoes of the Oku Volcanic Field. The Cameroon Line extends under the Atlantic Ocean, forming the volcanoes of Sao Tome, Principe, Annobon and Fernando Poo islands. 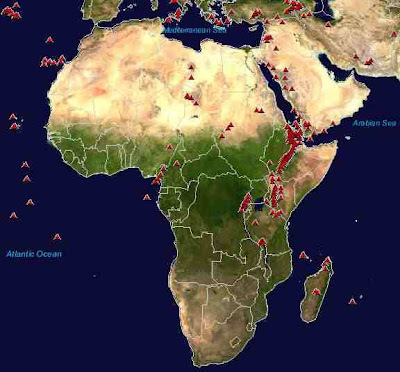 Map showing the distribution of volcanoes in Africa and the surrounding area. Eruptions from Mount Nyamuragira also tend to be unusually rich in Sulphur Dioxide (SO₂), with the volcano producing a large proportion of all the volcanic SO₂ that enters our atmosphere. To give this a sense of proportion, about 75% of all the SO₂ entering our atmosphere originates from the burning of fossil fuels. The effects of SO₂ in the atmosphere are a little complicated. Firstly it is poisonous, though this is only a danger close to the source where it is concentrated. Since most people avoid going close to active volcanoes, this usually only presents a hazard to professional volcanologists. Secondly it mixes with water to form sulphuric acid, i.e. acid rain, which can be a major problem downwind of volcanic eruptions and large industrial centers, with the rain causing severe damage to vegetation and aquatic life. Thirdly SO₂ droplets act as coolant. Since both volcanic and industrial SO₂ is usually produced alongside larger quantities of Carbon Dioxide (CO₂), which is a greenhouse gas, this is usually a negligible effect, but cooler weather can be produced downwind of major eruptions, as the CO₂ disperses more rapidly than the SO₂. 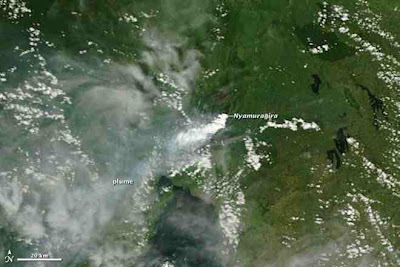 Satellite image of the plume emerging from Mount Nyamuragira, taken on 7 November 2011 by the NASA Earth Observatory. See also Eruptions on Mount Ebro, Ongoing volcanic activity on El Hierro, Snowfall in Namibia and Volcanoes on Sciency Thoughts YouTube. 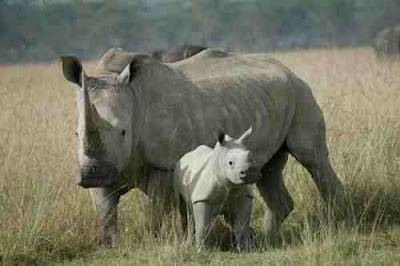 The Western Black Rhino and Vietnamese Rhino declared extinct, November 2011. In November 2011 the Western Black Rhinoceros, Diceros bicornis longpipes, was formally declared extinct by the International Union for Conservation of Nature, in the latest version of the Red List of Threatened Species, the annual publication in which they detail the state of the world's wildlife. This subspecies of the Black Rhino had been classified as Critically Endangered since 2000, when there were an estimated ten animals left in a single population in northern Cameroon. A survey in 2006 failed to locate a single specimen, and, since none have been reported in the intervening time, this year the IUCN took the final step of actually declaring the species extinct. 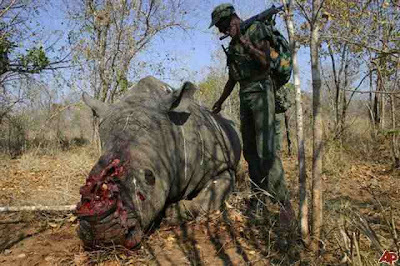 It is thought that the last few animals had been killed by poachers. The last other population, in Chad, was declared extinct in 1990. 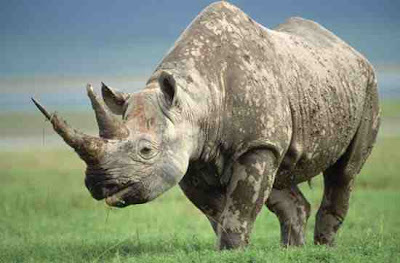 The Western Black Rhino, now believed to be extinct. There are three other subspecies of Black Rhinoceros, the Eastern (D. bicornis michaeli), the South Western (D. bicornis bicornis) and the South Central (D. bicornis minor). All of these are considered to be Critically Endangered, the most severe classification the IUCN gives to species known to have members surviving in the wild. There were estimated to be 700 Eastern Black Rhinoceroses surviving in Kenya and northern Tanzania in 2008. There were thought to be 943 surviving South Western Black Rhinoceroses in 2001, almost entirely in Namibia, but with a few in South Africa where the subspecies has been re-introduced after going extinct. The South Central Black Rhino survives in South Africa, Namibia, Swaziland and southern Tanzania; a 2001 survey put the total population at 1651. The other species of African Rhino, the White Rhinoceros, has two subspecies. The Southern White Rhinoceros, Ceratotherium simum simum, with an estimated 17 460 surviving individuals across South Africa, Namibia, Botswana, Zimbabwe, Mozambique, Zambia, Kenya and Uganda (in the last three countries it is an introduced species outside of its historical range). The Northern White Rhinoceros, C. simum cottoni (sometimes considered a separate species, C. cottoni), is considered to be extinct in the wild, though there is a captive breeding program at Dvůr Králové Zoo in the Czech Republic, from which there have been attempts to re-introduce animals to Kenya. A report of breeding Northern White Rhinos in Zambia in September 2011 seems unlikely, as this is far from the known historical range of the species. The Southern White Rhino, now Africa's most widespread Rhinoceros. All African rhino populations are in severe danger due to poaching. The International Rhino Foundation estimates that 309 rhinos have been killed by poachers so far this year in South Africa alone, despite the fact that South African rhinos are probably the best protected in the world. This is thought to be driven largely by the use of rhino horn in East Asian medicine, which has increased with expanding trade between Africa and the Far East, and has been linked to organized crime in both regions. A game warden surveys the work of Rhino Poachers in a South African national park. This year's IUCN Red List also announced the official extinction of the Vietnamese Rhinoceros, Rhinoceros sondaicus annamiticus, a subspecies of the Javan Rhinoceros, reducing the species to a single known population of about 40 individuals of the subspecies R. sondaicus sondaicus in the Ujung Kulon National Park in western Java. Javan Rhinos had been surviving in the Cat Tien National Park in Vietnam, but DNA analysis of dung collected in 2009-10 suggested that only a single individual was surviving. Shortly after this a dead rhino with its horn removed was reported to the WWF in Vietnam, suggesting this subspecies had also fallen to poaching. A third subspecies of Javan Rhino, R. sondaicus inermis, formerly found across Burma (Myanmar) Bangladesh and parts of India, is thought to have gone extinct in the 1920s. A Javan Rhino at Berlin Zoo. 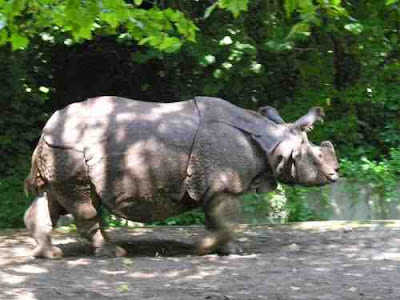 Like African Rhinos, Asian species have been widely targeted by poachers, and in addition have suffered extensive habitat loss due to deforestation; Asian rhinos tend to inhabit woodland rather than grassland. The Sumatran Rhinoceros, Dicerorhinus sumatrensis, is now estimated by the International Rhino Foundation to number less than 200 in the wild. Between twelve and twenty five survive in Sabah, Malaysia, belonging to the subspecies D. sumatrensis harrisoni (the Eastern Sumatran or Borneo Rhinoceros). The remainder belong to the subspecies D. sumatrensis sumatrensis, or Western Sumatran Rhinoceros, found in scattered populations in the Gunung Leuser, Way Kambas and Bukit Barisan Seletan National Parks, all on Sumatra. 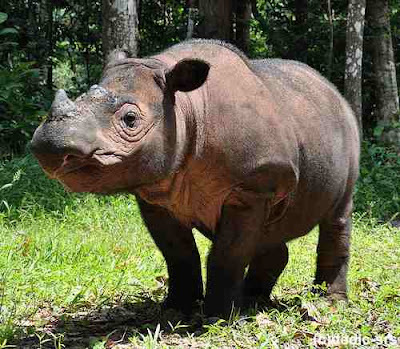 A third subspecies of Sumatran Rhino, D. sumatrensis lasiotis, the Northern Sumatran Rhino, is thought to be extinct. It was formerly found in India, Bangladesh and Burma (Myanmar). A Sumatran Rhino at Way Kambas National Park in Sumatra. The third species of Asian Rhino, Rhinoceros unicornis, the Indian or Greater One-Horned Rhino, is found in India and Nepal. There are thought to be about 2800 individuals surviving in the wild. It is listed by the IUCN as Vulnerable, the only species of rhino that is not considered Critically Endangered. 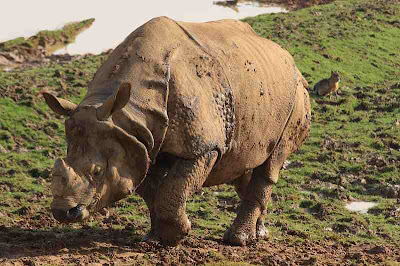 An Indian Rhino at Whipsnade Zoo. See also A Wooly Rhino from the Pliocene of Tibet and Mammals on Sciency Thoughts YouTube. At least 21 miners killed in mining disaster in Yunnan Province, China. At about 6.30 am local time (10.30 GMT) on Thursday 10 November 2011 miners at the Sizhuang Coal Mine near Qujing in Shizong County, Yunnan encountered a pocket of pressurized methane gas, causing an explosion that trapped 43 workers underground, according to the Yunnan Provincial Emergency Response Office. Twenty-one of the trapped miners have now been confirmed dead, and the State Administration of Work Safety and State Administration of Coal Mine Safety are overseeing efforts to rescue the remaining workers, in conjunction with the local fire service and emergency medical teams. These efforts are being hampered by the (flammable) gas remaining in the mine. Map of Yunnan Province, showing the location of Quijing, to the east of Kunming, the state capital. The Shizhuang Coal Mine has a poor safety record; in 2005 another gas explosion, followed by a fire, killed five workers and in November last year the Yunnan Administration of Coal Mine Safety revoked the mine's license on safety grounds, since when it has apparently operating illegally. China's coal industry has expanded rapidly as the country has industrialized, with production trebling in the last ten years, but this expansion has been plagued by safety problems, with Chinese mines gaining a reputation as the most dangerous in the world. However the authorities have been making efforts to remedy this situation, introducing safety regulations and closing (or at least attempting to close) mines that fail to comply. Annual deaths in Chinese mines have steadily fallen from 6995 in 2002 to 2433 in 2010, and while this is clearly still far too many (as is one) it is definitely progress. 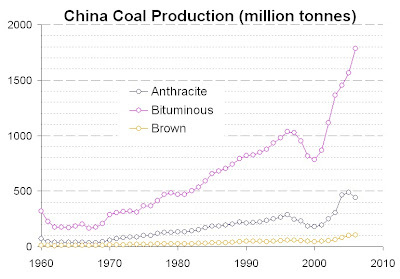 The expansion in Chinese coal mining in the last 50 years. Coal is formed when buried organic material, principally wood, in heated and pressurized, forcing off hydrogen and oxygen (i.e. water) and leaving more-or-less pure carbon. Methane is formed by the decay of organic material within the coal. There is typically little pore-space within coal, but the methane can be trapped in a liquid form under pressure. Some countries have started to extract this gas as a fuel in its own right. When this pressure is released suddenly, as by mining activity, then the methane turns back to a gas, expanding rapidly causing, an explosion. This is a bit like the pressure being released on a carbonated drink; the term 'explosion' does not necessarily imply fire in this context, although as methane is flammable this is quite likely. Rescue workers trying to identify dead miners at the Shizhuang Mine. See also Disaster at Gleision Colliery, Godre'r Graig, West Glamorgan. Oklahoma shaken by series of earthquakes; 5-6 November 2011. Slightly after 2.10 am local time (slightly after 7.10 pm GMT) he state of Oklahoma was shaken by a quake measured by the United States Geological Survey as measuring 4.7 on the Richter Scale, which occurred at a depth of approximately 5 km, 75 km to the east of Oklahoma City. Just before 11 pm local time on Saturday 5 November (slightly before 4 am on Sunday 6, GMT) a second quake measuring 5.6 on the Richter Scale, shook the same area. A little before 3.40 am local time (just before 9.40 am GMT) a third quake measuring 4 on the Richter scale struck in roughly the same place. Over the same period there have been about 10 small quakes measuring less than 4 on the Richter Scale. There are no reports of any casualties, but some reports on damage to houses in Lincoln County. At 5.6 on the the Richter scale the largest of these quakes is also the largest ever recorded in Oklahoma. Prior to this the largest recorded had been a magnitude 5.5 quake in El Reno (to the east of Oklahoma City) in 1952, which caused widespread alarm and several thousand dollars worth of damage but no casualties. In 1969 a magnitude 4.6 quake hit Wewoka (southeast of Oklahoma City) without causing significant damage. In 2010 a 4.7 magnitude quake shook Cleveland in the north of the state, again causing only minor damage. The source of these earthquakes is not completely clear, though the Oklahoma Geological Survey suggest that they may be linked to the Meers Fault in the southwest of the state, though this fault is generally thought to be inactive. In 1995 Meridee Jones-Cecil of the USGS published a paper in the Bulletin of the Geological Society of America suggesting that this fault was associated with structures in the basement rocks (i.e. rocks deep bellow the surface) and that it could become active again. 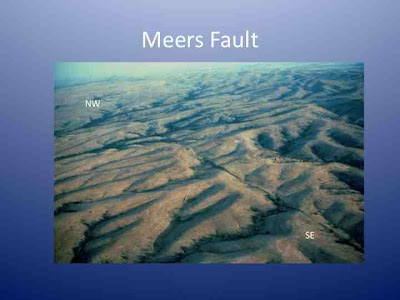 An aerial photograph of the Meers Fault. If you felt this quake you can report it to the United States Geological Survey here, and the Oklahoma Geological Survey here; both organizations find this information very useful as more reports help them to build up a more detailed picture of how quakes have occurred. See also Quebec Earthquake, 27 August 2011, Colorado Shaken by Earthquake, Virginia earthquake shakes Washington, New York and Earthquakes on Sciency Thoughts Youtube. A close encounter with Asteroid 2005 YU₅₅. On Tuesday 8 November 2005 Asteroid 2005 YU₅₅ will pass within 323 500 km of the Earth, roughly 85% of the distance to the moon. This is an unusual event, though not an alarming one. The last time a largish asteroid came this close to the Earth was 1976, and it will not happen again till 2028. 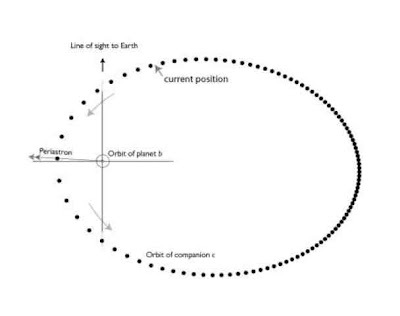 The orbit of 2005 YU₅₅ has been mapped for the next 100 years, as far as can be done accurately due to repeated close encounters with Earth, Mars and Venus, and scientists are confident that in tat time it will not hit us. The orbit of 2005 YU₅₅. Even if 2005 YU₅₅ were to collide with the Earth, it is not exactly end of the world material. The asteroid has a diameter of ~400 m and is thought to be composed largely of carbonaceous material. Being directly underneath it would be unpleasant, and that much carbon being vaporized at once wouldn't do our climate any favors, but there is no danger of any global firestorms of tsunamis. However the asteroid is of great interest to amateur astronomers, to whom it represents a once-in-a-lifetime opportunity to actually spot a near Earth asteroid. 2005 YU₅₅ should be visible to viewers with good binoculars or small telescopes for several hours late on 8 November and early on 9 November, and will be best seen from the eastern United States. Th designation 2005 YU₅₅ indicates that the asteroid was discovered in 2005, after 16 December (the year is split into 24 two-week periods given the letters A to Y), and was the 1395th object discovered in this period. This last bit is derived from the 'U₅₅'; within each period the first object discovered is named 'A' the second 'B' and so on, until 'Z' is reached, indicating 25 (I is not used). The twenty-sixth object is then named 'A₁', the twenty seventh 'B₁' and so on, so that 'U₅₅' implies the 1395th (late December 2005 was obviously a productive period for asteroid discovery). See also The surface of Vesta, 2010 TK₇: Earth's Trojan Asteroid, Visiting Vesta, The End of the Cretaceous and Asteroid 2011MD. Labels: 2005 YU₅₅, Asteroid, Near Earth Asteroids. Fracking linked to earthquakes in Lancashire, northeast England. On Wednesday this week (2 November 2011) a report commissioned by petrochemical exploration company Cuadrilla Resources concluded that experimental hydraulic fractionation (fracking) carried out by the company at a site near Blackpool on the Lancashire coast had been responsible for two small earthquakes in the region in April and May this year, something they had been accused of by environmental protestors. The company suspended operations at the site after the second quake, but resumed during the summer. This week the site was occupied by environmental group Frack Off, causing another suspension of activity. 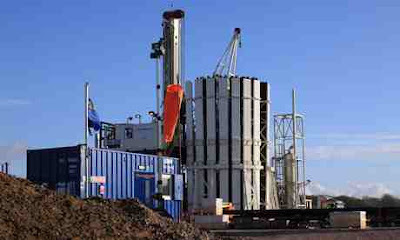 A Cuadrilla drilling rig in Lancashire. Hydraulic fractionation is a process by which pressurized gas, water or other chemicals are forced into brittle, impermeable rock believed to contain gas reserves, in this case the Bowland Shale, fracturing the rock to release the gas. In this sense the whole purpose of the process is to cause earthquakes, though not as large as the ones produced in Lancashire. Ideally the process would produce quakes with magnitudes of less than one on the Richter Scale, the quakes recorded this spring near Blackpool had magnitudes of 2.3 and 1.5 respectively; hardly devastating, but since they were quite shallow, widely felt in this populous region. Numerous smaller quakes were also detected by seismometers, but not noticed by the local population. This is unusual but not unprecedented; fracking operations on the Eola Field in Oklahoma have produced quakes with magnitudes of up to 2.8, and the process has been linked to similar sized tremors in Texas. The report cites 'unusual geology' around the site as the cause of the unexpectedly large quakes, though this seems a little disingenuous; a company like this would normally be expected to study the geology at a site like this before beginning operations. The report concludes that the operation is unlikely to cause earthquakes with magnitudes of greater than 3, not enough to present a danger to the public and less than produced by some mining activities, particularly those involving blasting. This is unlikely to be reassuring to residents of the region; what the report is effectively saying is that they did not expect the fracking to cause quakes big enough to be noticed, but now that they have done so they do not expect to produce quakes big enough to be dangerous. In fairness it is difficult to see how they could produce a quake much larger than this, even if they wanted to, without inputting a lot more energy. The Richter Scale is logarithmic, so that a magnitude 3 quake is 100 times as great as a magnitude 1 quake. A magnitude 4 quake (still unlikely to be dangerous) is 10 times as large again, i.e. over a thousand times larger than the quakes they would be trying to cause (with a magnitude of less than one). However this is not quite the point. The people of Lancashire have effectively found they are now living above an artillery firing range; it may not be actually dangerous, but it remains to be seen if they will accept this happily, and if not whether they will be able to do anything about it. Environmentalists are widely opposed to fracking for reasons other than earthquakes. Firstly they are generally opposed to increasing hydrocarbon exploration, since burning fossil fuels increases the level of CO₂ in the atmosphere, leading to climate change. Secondly, and more specifically, fracking has been linked to the release of other chemicals trapped within strata, contaminating groundwater with toxic and carcinogenic hydrocarbons. Hydraulic fractioning is currently banned in France for environmental reasons. There are also temporary moratoria in place in South Africa, New South Wales, Quebec and New York State. This week also sees a summit on shale gas production in London, which is likely to determine the future of the industry in the UK. There is a great deal of potential for the expansion of the industry, particularly in northern England, with some shale gas deposits in the Midlands, northern Wales and southern Scotland. The UK's current government is likely to be favorable to expansion of the industry, with a number of ministers who apparently see all environmental legislation as unnecessary 'red tape', but it is also likely that public opposition to the process will be strong, particularly if it becomes associated in the public's eyes with earthquakes. 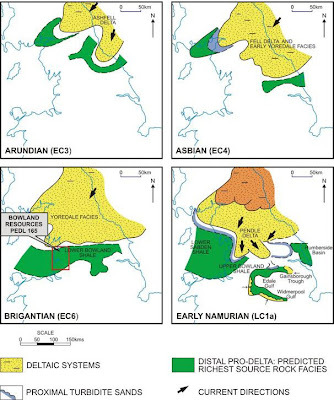 Maps showing the location of ancient turbidite deposits in Britain, with the areas thought to contain shale gas deposits in green. Turbidites are deposits caused by massive submarine landslips, which sweep thousands of tonnes of sediment and associated lifeforms into the deep ocean. Over time these lifeforms decay, releasing methane gas which becomes trapped in the sediments. The deposits all date from the Carboniferous, with the oldest from the Arundian being about 345 million years old and the youngest from the Early Namurian being about 325 million years old. See also River Neath turned orange by mining runoff, The UN reports on oil pollution in Ogoniland and Greenpeace activists occupy the offices of Cairn Energy. Is there a case for an airport on the Hoo Peninsula? Recent years have seen increased demands for increased airport capacity around London. Various ideas have emerged as to how this could be met. There have been proposals to expand existing airports such as Heathrow, Birmingham or Manston, as well as a number of proposals for new airports on the Themes Estuary. There has been much debate this summer on the possibility of a new airport being constructed on a specially built island in the Themes Estuary, an idea favored by Boris Johnson, the Mayor of London, though this idea has now been rejected by the UK government. There has also been a revival of a plan to build an airport at Cliffe on the Hoo Peninsula by John Olsen, the former head of the airline Cathay Pacific. This idea was rejected by the previous (Labour) government in 2003 as unworkable for a number of reasons, but it is possible that the new government will reconsider this. It has been rumored that Transport for London favor this proposal, though there has been no official conformation of this. There has been strong opposition from North Kent MP's and Medway Council, a unitary authority with remit for the Hoo Peninsula. This week (the first week in November 2011) saw the unveiling of a new proposal for an airport on the Isle of Grain, also part of the Hoo Peninsula, by architect Lord Norman Foster and consultants Halcrow. This proposal includes not just the airport, but a substantial reworking of the regional transport network, including a new high-speed London-orbital train network, as well as the reclamation of a substantial area of land around the Themes and Medway estuaries upon which new housing and businesses could be located, a major new shipping terminal on the Medway and improved flood defenses for the Themes Estuary. This has also attracted strong opposition from Medway Council, as well as environmental groups such as Friends of the Earth. There are arguments both for-and-against the building of a new airport on the Hoo Peninsula, which I shall try to examine in detail, though many of them are far from new, in order to reach a reasoned conclusion of the viability of these projects. The arguments for a new airport. The UK is falling behind emerging economies such as Russia, China, Brazil and India (Lord Foster's list, not mine) and needs major new infrastructure projects to compete. The UK is certainly falling behind many other economies, both developing and developed, largely due to the decline of its manufacturing base since the 1980s, and improvements in infrastructure will certainly be necessary in order to recover some of this loss. However this does not mean that every proposed infrastructure scheme is a good thing; such projects are extremely expensive (the figure £50 billion has been floated for the Grain Airport and related projects), and before investing governments should make sure the projects will be genuinely beneficial. The economist John Maynard Keynes once observed that in times of economic downturn governments should pay people to dig holes and fill them in again if they can't think of anything more sensible for them to do, which is broadly true, but it does not follow that all big projects are more sensible than digging and filling in holes for the sake of it. Post-war Britain has an unenviable record of white elephant infrastructure projects, so simply appealing for support for a project because we need big projects is not enough. In the case of the developing economies listed by Lord Foster all four have expanding economies based upon low costs for energy, low rents, cheap (or free) education, low costs of living and (therefore) low labour costs. Without addressing these the UK is unlikely to recover its manufacturing base; in particular UK politicians and business leaders often seem to be looking for ways to reduce labour costs without reducing the cost of living, and without recognizing that these costs (high energy bills, rents, transport costs etc.) often also directly impact businesses. We particularly need increased air passenger capacity to boost our economy. Frankfurt is building a new hub airport, and we may be unable to compete. Heathrow is already the busiest airport in Europe, and the third busiest in the world. Gatwick is the ninth busiest in Europe, Stansted the twenty-second and Luton the forty-second. Nine more UK airports fall within the top one-hundred busiest in Europe. Only one other city (Moscow) has three airports in the European top one-hundred. Compared to the UK only Italy has more airports in the European hundred busiest, fourteen compared to our thirteen, but of these only three are in the top fifty; less than London alone. These statistics would be less impressive if the majority of UK airports were running at the limit of their capacity, but many are in fact somewhat underused. For example Birmingham, already the forty-fifth busiest in Europe, is hoping the new High Speed Rail Link will enable it to expand towards its full capacity. 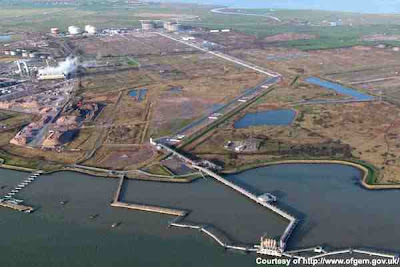 The Isle of Grain project will also involve building new homes, something the area is short on. 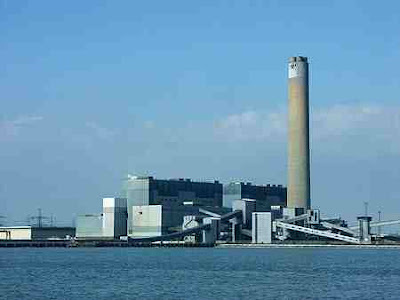 There is certainly a shortage of housing around the Medway Estuary, as in much of Southeast England, which is often quoted as a reason for projects which involve some housing. But what the Southeast, and Kent in particular, is really short on is fresh water to supply any new housing. Kent has been suffering summer droughts regularly since the 1970s, due to a combination of low rainfall and a shortage of reservoirs. Without measures to improve this any new housing projects are likely to place further strain on the counties water supplies. A more practical approach to solving the counties housing problems might therefore be a combination of reducing the amount of rented accommodation in the county (people living in rented housing often show up on statistics as looking for housing to buy; this does not mean they do not have a home, just that they do not own it), and investment in infrastructure in other parts of the country, to slow the continual draw of people to the Southeast. The arguments against a new airport. The salt marshes around the Hoo Peninsula form part of the Themes Estuary and Marshes Special Protection Area, an important wilderness area close to London and the Medway Towns, and an internationally important overwintering site for water-fowl, as well as a summer breeding site for many rare species. In recent years conservation has become a politically polarized issue in the UK, and many other countries. Politicians on the left tend to at least pay lip-service to conservation as an ideal, whereas those on the right tend to object that it often gets in the way of economic development. This automatic adoption of stances is not helpful, if only because it often leads to debates between two sides that have not fully thought their own arguments through. Historically many people we would now consider great thinkers did not follow this pattern, conservatives have indeed sought to conserve nature whereas liberals and socialists have favored economic development. Certainly the area is of importance to many species of water birds, though improved environmental controls in rivers and wetlands across Northern Europe means that there are more sites available than was previously the case. Where these marshes are really important is that they are one of the few wilderness areas available close to London, Europe's largest city. This is largely an aesthetic argument, that people need access to genuine wild places rather than just parkland (with which London is amply supplied), and one that has become slightly unfashionable in recent years, but to remove such a resource from so large a population simply because one does not believe they are entitled to it is remarkably arrogant. Such sights do attract visitors, and in doing so they bring investment and create jobs. (Disclaimer: I have previously worked for the RSPB and a close relative has worked in wetlands conservation on the Medway Estuary. I would happily take such a job above one at an airport). An airport on the Hoo Peninsula would lead to excessive aircraft noise in the densely populated Medway Towns. Certainly being under the flight path of aircraft arriving at or leaving an airport is highly disruptive, but the planners do seem to have thought this one through, with the proposed flight paths over the Themes Estuary rather than over populated areas, as is the case with airports such as Heathrow and Gatwick. Weather this would apply in all weather conditions is unclear. The proposed plans would lead to the destruction of several villages on the Hoo Peninsula, communities that have existed for a long time and should not be asked to pay the price for economic benefits for others. Ultimately this is a value judgement. Many projects in the past have had similar impacts, and many more in the future will no doubt do so. It is also clear that many people feel that this is deeply morally wrong, as can be seen by the regular protests that pop-up where communities are threatened by development projects, often attracting protesters from far away. The Themes Estuary is home to many thousands of geese. Aircraft are a threat to geese, but equally geese are a threat to aircraft. Birdstrike (where a large bird such as a goose enters a jet engine with devastating consequences) is a major cause of civil aviation disasters. One of the reasons that the Cliffe Airport proposal was dropped in 2003 was a study that suggested an airport on the Themes Estuary would have at least as high a risk of birdstrike as any current UK airport, and possibly as much as twelve times the level of risk. Surprisingly where aircraft come into conflict with geese the geese tend to win out in the long run, since collisions tend to result in the loss of as many aircraft as geese, and geese are rather easier to replace. The Hoo Peninsula is low-lying, and would be at risk from rising sea-levels due to global warming. This is true, although the Grain Airport proposals do include improved sea defenses for the Themes Estuary. Ultimately this depends on how bad sea level rise gets. The worst case scenarios put most of London underwater, which would rather reduce the need for an extra airport to serve it. Also improved sea defenses for London and Medway shift the danger of flooding from a tsunami-type event further out on the estuary, increasing the risk of flooding in East Kent and Essex. Aircraft contribute to greenhouse gas emissions, and therefore global warming. We should be looking at ways to reduce air-travel, not increase it. Again this is true, though unclear if this is a persuasive argument. This is another area where debate has become politically polarized, with many politicians on the right, including a majority of current Conservative MPs in the UK, simply refusing to believe in climate change. This is a fairly new development; Margaret Thatcher (who studied Chemistry at Oxford University and is a Fellow of the Royal Society) was one of the first world leaders to recognize the threat presented by global warming. As such it is possible that this trend may be reversed and politicians will start to look at this subject without partizan pre-judgement, particularly if the effects of climate change start to become more pronounced, but at the moment this can tend to stall debate. Aircraft produce dangerous levels of nitrous oxides (NOx) which are harmful to health, so building major new airports near to population centers such as the Medway Towns should be avoided. Again this is somewhat of a political value judgement. Repeated studies have shown this to be a threat, but we continue to build airports close to towns as many politicians believe the economic benefits outweigh the costs. Building an airport near to the Grain LNG Terminal would be extremely dangerous. It would; as noted above, these projects must involve moving the terminal, even if this isn't being spelt out. The site is close to the wreck of the SS Richard Montgomery, which is full of explosives and may explode at any time. The SS Richard Montgomery sank in 1944 off the coast of Sheerness (where it can still clearly be seen), and was indeed packed with explosives. Nobody really knows how dangerous this is, though the wreck has been there for 65 years without exploding, so it is likely that the seawater has had some chemical effect on the contents of the hold. In any case a ship-load of explosives near an airport does not seem notably more dangerous than a ship-load of explosives near an LNG Terminal. There are extensive wind-farms on the Themes Estuary, and increased air-traffic may interfere with these. There is no evidence that this is the case, and in any case the Grain Airport does include a tidal barrage which would also generate green energy. However there is considerable evidence that wind-turbines can interfere with radar on aircraft, which makes it hard to obtain permission to build wind farms near airports or flight paths. If this is the case then it is likely that the building of a major airport on the Themes Estuary would require the removal of many turbines from the area. We are running low on oil reserves, and it is unlikely that we will have enough aviation fuel in future to permit cheap, mass air travel. This is a very real threat to the aviation industry. We know we are close too, or may even have passed, Peak Oil (the point at which we have taken more oil out of the ground than there is left in it) and that our oil consumption continues to grow. While there are plans of sorts to switch electricity production, and fuel for cars, to other sources, the aviation industry remains heavily dependent on petrochemicals. Solar powered aircraft have been successfully demonstrated, but with nothing like the capacity to lift a commercial airliner. This makes bio-fuels (oil products derived from crops) the most likely future fuel for aircraft. But such fuels would almost certainly be far more expensive than fossil fuels, since the crops from which they are derived would have to compete for agricultural land against food crops in a world with a rising population. Since Lord Foster admits his airport would take between fifteen and twenty-five years to bring to completion it is likely that this problem will rear its head long before the airport is complete. In conclusion then, it would seem likely that a new airport on the Hoo Peninsula would be highly disruptive to the local environment, population and existing businesses in the area, and that it would have, at best, doubtful economic benefits. Having said that many of the peripheral projects associated with the Grain Airport plan could potentially be beneficial to the local economy, and might therefore be worth pursuing in their own right.